More Olympic spirit brings more Olympic stamps! Another set of Olympic stamps has begun being issued by Canada Post on February 22nd, 2010. 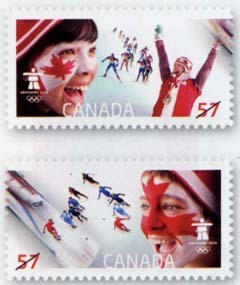 Featuring an attractive red and white design, the stamps illustrate two youngsters in face paint obviously enthralled by the games. The backdrop depicts different Winter Olympic disciplines: bobsleigh, women’s cross country skiing, and men’s short track relay speed skating. There is also an image of Chandra Crawford winning gold in Torino, Italy in 2006 for cross country skiing.